One need only to look into a mirror. Today a good friend of mine ripped out the article from her local Inner West newspaper and sent it to me. It echoes an article I shared last night on social media, about the fact that Wicked Campers is seeking council approval to open a depot on Church Street in St Peters, Sydney. This will mean that, being near a primary school, children will regularly see some of the more unsavoury and insensitive slogans that Wicked Campers pride themselves on. 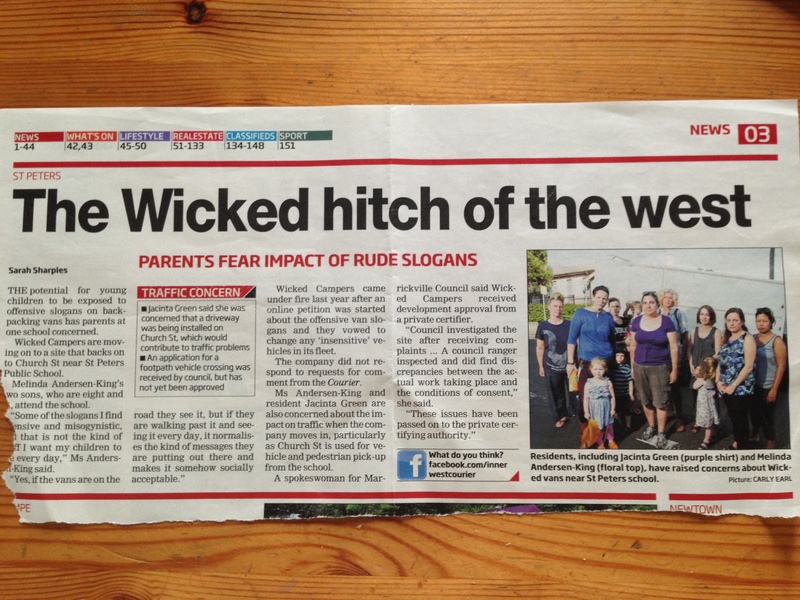 Local parents aren’t happy; well the mums taking a stand in the picture definitely aren’t. 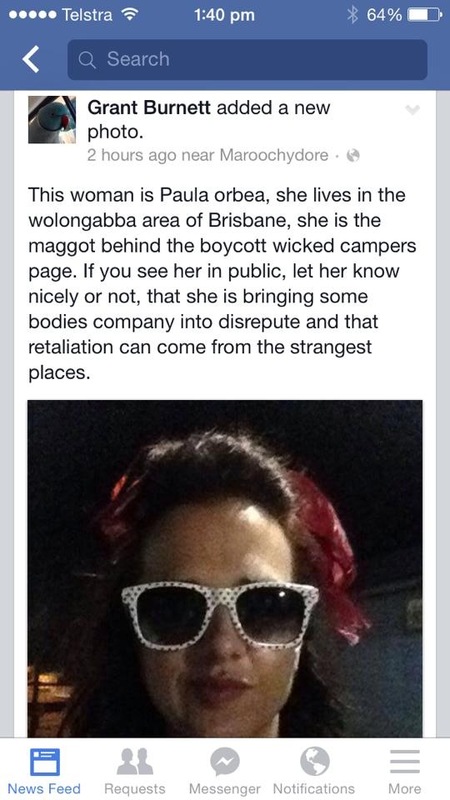 Eight moths ago, when I ran the campaign asking Wicked Campers to remove misogynistic and degrading slogans, there was outrage – OUTRAGE, I say – coursing through the Internet like hot lava. It spurred a little bit of hateful debate but for the most part, a sense of solidarity prevailed from both sexes; agreeing that Wicked Campers has some pretty offensive and degrading slogans driving around our public spaces. 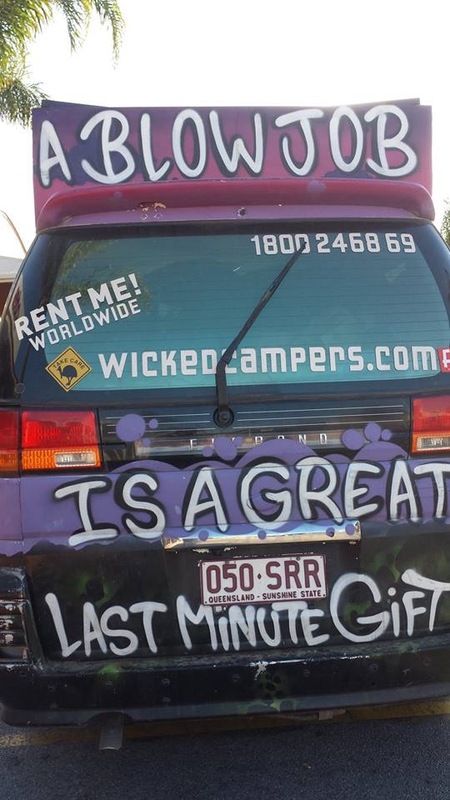 So much so, The Senate unanimously voted to condemn them and Wicked Campers themselves promised they would remove ‘insensitive slogans’. Their word; insensitive. So with ALL that – where are we today? All I can say is; The standard we walk past, is the standard we accept. This Wicked crusade has been a fascinating, albeit depressing, social experiment in my eyes. July 2014? Fury and lividity. Fast forward six months, when I wrote of their contempt and loss of integrity – all I heard, was the sound of crickets. Few shared the update and when I contacted some of the news people who originally reported on this important ‘hot’ issue with fervour and expressed their equal indignation, I received a tepid response; with some referring it on to others, who never called me back. No stories were run. As a collective, Australia went on as a bystander again. Question#224: Is this the standard we want to teach? And as for the absence of male voices and faces in the fight against all this; I believe that as a society – and more importantly, as a culture – we are not only teaching our youth that perspectives like these have our permission to advertise themselves, we are also teaching our youth that because males aren’t standing on an equally visible, vocal platform – it makes it doubly OK. When it comes to battles asking for a little more humanity, women hold the front line. Without resorting to blood-shed, women put them selves ‘out there’ none the less; feeling fear and vulnerability, and risk crossing paths with threatening and violent Internet trolls. Due to this campaign, I received two violent messages from the same person (amongst others) and had a Wanted style poster made of me – falsely identifying where I lived. Imagine if he had been right. Neither Facebook nor the Police did anything. And here I was naively thinking it was against the law to threaten someone. With proof, no less. Lastly, noone – especially the women who publicly question – actually wants any of this. I put up an update because I thought people would want to be informed; you know, considering that initial reaction. But I’m tired. I’m tired of the walls and the apathy. I’m tired of feeling helpless because problems like this can’t be solved with just the ideas of a few – it needs people power to make change occur. And people power is simply doing something. Anything. Regardless of who one is or what position one holds. This includes John Webb, owner of Wicked Campers. (It’s never too late, John). And to be clear – this is not about burning this business to the ground nor using threats or violence – it is about finding a solution to the problem, and that problem is that certain slogans need to come down. Question #225: So what can YOU do? Write, call, gather, talk – whatever. Down to earth blogger and all-round amazing human, Eden Riley, was active and did it her way; numerous people have written to me, telling me they have contacted camp sites to enquire about their policy regarding Wicked vans – some sites don’t let the vans in, if they have offensive slogans. Let backpackers know this. Others have written to their political reps.
And today I applaud the women who are going to tackle the fight at St Peters. I’m with you wholeheartedly.